Via The Economist – GAZIANTEP | Returning to Turkey from Germany with four children in tow was not easy for Faisl Alakrch, a 36-year-old Syrian. He had to use a people-smuggler to retrace, in reverse, the route he had taken the year before. His younger brothers have remained in Germany and are studying at university, but he wanted to work, and complains that “I could not do anything there.” Turkey, by contrast, has made it easy for him to operate. He was able to register a company and set up a café in Gaziantep, a city close to the Syrian border. He has now been invited to become a Turkish citizen. His six-year-old son speaks a mixture of German, Turkish and Arabic. Around 3.5m Syrians live in Turkey, the largest number of refugees anywhere in the world. Turkey is not fully signed up to the 1951 Refugee Convention so, although Syrians there get access to health care, education and a small stipend, partly paid for by the European Union, they do not receive the many benefits that refugees in the EU get, such as accommodation and child benefit. Nevertheless, Turkey is proving a better refuge for many than Europe. One reason is that Turkey is close to home for many of the refugees. Syrians flooded in to Gaziantep, a town around two hours’ drive away from Aleppo, at such a rate in 2014 that its population reached its projected size for 2030 that year, says Onder Yalcin, the head of the migration office. Many knew the city from before the war, and that has helped them integrate. Gaziantep’s old town resembles that of Aleppo. “I like Turkey because it is similar to Syria; they have the same streets,” says Khaldoon Ibabede, a 19-year-old who moved back to Turkey after two and a half years in Germany, where he missed his family and wider sense of community. The Turkish government’s more informal approach means most Syrians there are not in ghettos, as they are in parts of Europe, nor in camps, as they are in Jordan and Lebanon. Only around 7% of those in Turkey are in camps; some 40,000 have been given Turkish citizenship. Freedom to work is the biggest benefit that Turkey offers. A tiny share of the refugee population—around 14,000, according to one estimate—has work permits, but almost all Syrians work informally, mostly in factories. According to the chairman of a garment-manufacturing company, Turkish shelves would be empty without Syrian workers. Mr Yalcin says Syrian workers are reintroducing some skills which were being lost in Turkey, such as copper-working and stone-carving. Some refugees are entrepreneurs. 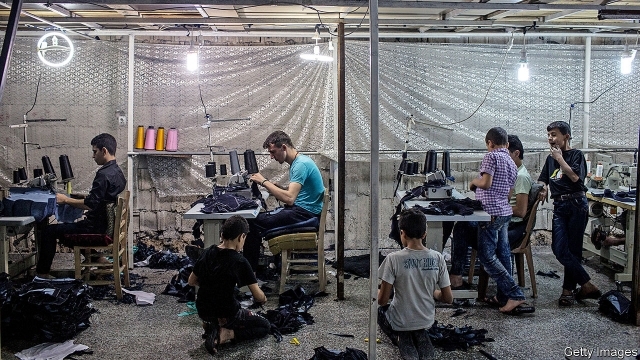 Khaled Oukab has started a factory in Gaziantep that sends women’s clothes to rebel strongholds in northern Syria and to Iraq. His brother has a business making denim for export. Economic activity helps integration, yet the lack of formal schemes could pose problems in the long run. Although the number of Syrian children in Turkish schools has increased, around 38% are still not in school, according to the International Crisis Group, a think-tank, partly because older children work to support their families. And the Syrians’ informal status could make them vulnerable. During the election campaign in June both President Recep Tayyip Erdogan and opposition leaders talked about sending them home. Anti-immigrant feeling is growing. Last year 24 Syrians died in anti-refugee attacks. Others face low-level abuse or discrimination from those who perceive Syrians to be taking jobs, causing crime or increasing prices. “We create problems for the middle class,” says Abdul Fatah Alhmoui, who runs a sandwich and falafel shop in Gaziantep; his Turkish brother-in-law has complained to him about higher rents. This article was originally published by The Economist.